Bout of Books 8.0 Grand Prize Winner! Bout of Books 8.0 has ended but the fun doesn't stop until the Grand Prize Winner is announced! Elizabeth's winning entry came from following @creativedeeds on Twitter! Keep your eye on your inbox, you'll be receiving emails from Amanda and Shirley soon! For those that are interested in helping out for the next Bout of Books, we post a call for help roughly a month prior to the start of the read-a-thon - which will be around December 9th for 9.0. Keep an eye on this blog for that announcement. Once again, thank you to everyone who helped make Bout of Books 8.0 a success! We appreciate that you love books and that you're willing to shout it to the stars! You have survived Bout of Books 8.0! Bout of Books 9.0 will be from January 6th to 12th. We'll have a #boutofbooks chat between now and January. Watch this space for details. The Book Monsters are hosting a REVIEW-A-THON starting TODAY through September 1st. 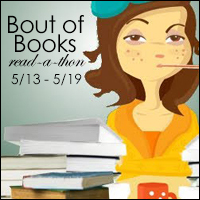 If all your reviews have piled up after Bout of Books, the Monster Review-a-thon is the perfect event for you. PS: The linky will remain open until September 6th. The way these updates work is that you post your progress for the previous day (today's link should be to your progress for the sixth day of the read-a-thon). Please include a DIRECT LINK to your update post. If you do not follow directions, your link will be deleted. The way these updates work is that you post your progress for the previous day (today's link should be to your progress for the fifth day of the read-a-thon). Please include a DIRECT LINK to your update post. If you do not follow directions, your link will be deleted. The way these updates work is that you post your progress for the previous day (today's link should be to your progress for the fourth day of the read-a-thon). Please include a DIRECT LINK to your update post. If you do not follow directions, your link will be deleted. The way these updates work is that you post your progress for the previous day (today's link should be to your progress for the third day of the read-a-thon). Please include a DIRECT LINK to your update post. If you do not follow directions, your link will be deleted. The way these updates work is that you post your progress for the previous day (today's link should be to your progress for the second day of the read-a-thon). Please include a DIRECT LINK to your update post. If you do not follow directions, your link will be deleted. Welcome to Bout of Books 8.0! Bout of Books 8.0 Schedule and Social Hour Sign Up! We are also opening Social Hour signups! This list is for building our Twitter list. If you have a Twitter account and would like to be on our Twitter list, head on over to the Social Hour page!